As the economic noose tightens around European airlines, the industry's ranks look set to thin this year. Over late 2011 and the first month of 2012, the industry has witnessed the collapse of four small European carriers as well as the announcement of a merger between Wind Jet and Blue Panorama Airlines by Alitalia. For the time being, it is predominantly smaller, lower capitalised airlines that have failed. The four failed carriers deploy only around 217,000 weekly seats or 0.6% of total European system capacity. However, the collapses, which follow more than 30 European airline failures over the 2008/09 economic crisis, could in the coming months foreshadow the demise of further carriers or further consolidation, with a number of financially weak carriers operating in the European market. While all but one of the airlines affected so far in 2012 have been based in Continental Europe, there are several weak carriers in Eastern Europe urgently seeking further funding and/or new investors in the near term. Three of the collapsed carriers have been privately owned, but last week's collapse of Spanair shows governments may be willing to let state-supported carriers dither away. Governments are now reluctant or unable to prop up their ailing national airlines as the debt crisis forces unpopular austerity programmes right across the economy. State investors in TAP, LOT Polish Airlines, Malev, SAS, Aer Lingus, and CSA Czech Airlines have all signalled their intention to reduce direct support and seek new investors. Not all of these are endangered, but with only a small pool of prospective purchasers, some are more at risk than others. International Airlines Group, which owns British Airways and Iberia, is keenly interested in TAP, while Turkish Airlines is interested in LOT. Malev has been chartering a course back to profitability but this week the carrier, according to a Reuters report, told its board that financing its operations was unsustainable. The announcement followed the Government taking measures to protect the carrier against bankruptcy, although earlier in the month the European Commission ruled Malev effectively received illegal state loans of EUR280 million between 2007-2010 and would have to pay back a percentage to the Government. The largest failure has been last week's announcement that low-cost operator Spanair was ceasing operations on 28-Jan-2012 as it was “faced with the lack of financial visibility for the coming months”, according to the carrier. The airline, which employed approximately 2000 staff, had been struggling in recent years, with its financial problems exacerbated by a blatant pilot error crash in 2008 that resulted in significant casualties. Spanair is the third Spanish airline to suspend operations during the past five years, following the suspension of Air Madrid in 2006 and Air Comet in 2009. The Spanair shutdown came after the regional Government of Catalonia stated that amidst Spain's economic downturn it would no longer fund the airline following Qatar Airways’ withdrawal from talks to purchase the carrier. The Government commented that “it is impossible for the Catalan government to provide new capital” for the carrier. Spanair was 85.6% owned by the Catalan Government and 10.9% owned by former parent SAS Scandinavian Airlines (SAS announced its profit will be affected by approximately SEK1.7 billion (USD252 million) due to Spanair's bankruptcy). The remainder was held by a group of Catalan businesspeople. Barcelona-based Spanair operated a range of short-haul services across Western Europe and Northern Africa but deployed the majority of its capacity in the domestic Spanish market. Founded in 1986, the airline was Spain’s fifth largest by system capacity, operating 5.9% of system capacity and 15.0% of domestic capacity, according to Innovata data. 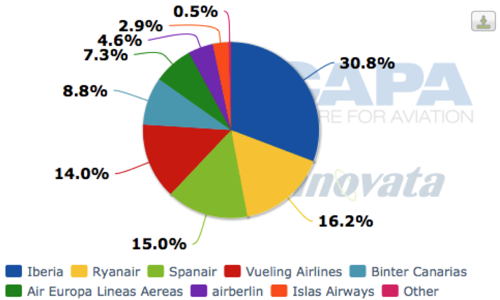 Its five largest hubs were (in order): Barcelona El Prat, Madrid Barajas, Palma de Mallorca, Bilbao and Gran Canaria Las Palmas. The airline, a member of the Star Alliance since 2003, operated a fleet of 30 aircraft including A320, A321 and MD-80 equipment. 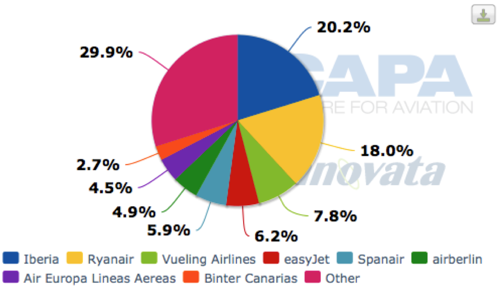 It is an ill wind that blows nobody any good: Iberia and Vueling will be the most likely beneficiaries and the two have already announced a series of Spanair routes that they will pick up as a result of the collapse. 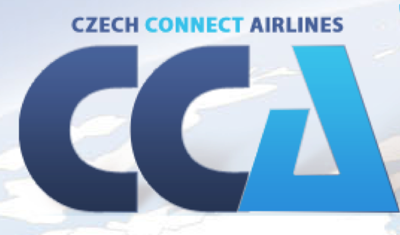 Czech Connect Airlines also filed for bankruptcy this month, with the operations of the Ostrava-based carrier ceasing on 24-Jan-2012. The carrier has confirmed that the insolvency proceeding of the airline has been filed at Regional Court of Ostrava, Czech Republic. According to local media reports, the suspension occurred after one of the carrier's main investors withdrew from the carrier. The airline’s owners and management will be discussing measures to save Czech Connect Airlines, launched only last year, and to minimise the impact on customers, employees and business partners. Czech Connect Airlines' network was predominantly focussed on scheduled services to Russia and charter services for travel agencies to summer destinations. In 2011, the carrier handled around 108,000 passengers with a fleet of one Boeing 737-300 and a 737-400. Around 40% of its passenger base travelled on the carrier’s scheduled network. The airline had developed a small niche in the European market and had planned to launch services from Brno Tuřany to Moscow Domodedovo and St Petersburg Pulkovo International, from Karlovy Vary to Ekaterinburg and from Pardubice to Moscow Domodedovo in Jan-2012. The carrier was seeking to capitalise on the fast growing market for travel between Czech Republic and Russia, a market dominated by Czech Airlines and Aeroflot. Air Alps ceased operations on 13-Jan-2012 although it stated it is planning to resume operation on 01-Feb-2012, having requested the Italian Aviation Authority for a 14-day period to resume operations, according to aero.at reports. The Innsbruck-based regional carrier launched operations in Mar-1999. The carrier operated in the domestic Italian market from Rome Fiumicino to Bolzano/Bozen and Parma in close cooperation with Alitalia. It operated a fleet of two Fairchild/Dornier 328s, according to OAG. The carrier is affiliated with Welcome Aviation Group and Welcome Air, owned by Swiss Lions Air Group AG, which holds 76% of Air Alps. Negotiations are reportedly under way with Welcome Air either to take over the carrier or form a new carrier. Cirrus Airlines suspended operations on 20-Jan-2012 due to economic and market conditions, with the carrier confirming that Jochen RA Eisenbeis has been appointed as provisional liquidator. Cirrus Airlines subsequently filed an insolvency petition in the District Court in Saarbrücken. The Court will subsequently order a provisional liquidator on 24-Jan-2012 to the carrier, whose operations are currently suspended, according to dpa-AFX reports from 23-Jan-2012. 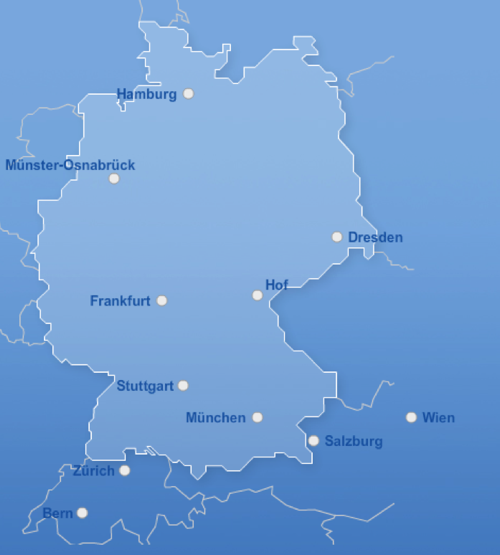 According to dpa and Handelsblatt reports, the Saarbrücken-based carrier is now in talks on the future of the company. The carrier will continue to pay its approximately 300 employees. The carrier, established in 1995, operated seven scheduled services within Germany and to Austria and Switzerland at the time of its suspension. Its fleet currently consists of seven aircraft. The carrier handled 200,000 passengers in 2011. Germany's Federal Aviation Administration has reportedly suspended the carrier's operating licence, with immediate effect. Commenting on the insolvency, Federation of German Industries (BDI) president Klaus-Peter Siegloch stated the insolvency "must be a wake up call for politicians" highlighting the economic pressure and narrow margins of the aviation industry. Alitalia has tentatively agreed to merge with Wind Jet and Blue Panorama Airlines. According to AGI reports, Alitalia has signed a MoU with both Italian carriers to this effect. Alitalia said the planned integration of Blue Panorama and Wind Jet is "consistent with the process of continuing consolidation" in the air transport sector, both domestically and internationally. It said the carriers have "synergistic and complementary profiles" regarding their network and fleet, which could be exploited in a tie-up. Wind Jet, founded in 2003, is an LCC operating short-haul European services. The carrier has hubs in Catania, Palermo and Rimini and, with a fleet of Airbus aircraft (five A319-100s and seven A320-200s) handled more than 2.8 million passengers in 2011. Wind Jet operates a network covering 12 destinations in Italy (Bologna Guglielmo Marconi Airport, Catania Fontanarossa Airport, Milan Bergamo/Orio al Serio Airport, Milan Linate Airport, Milan Malpensa Airport, Palermo Punta Raisi Airport, Pisa Galileo Galilei Airport, Rimini Miramare Airport, Rome Fiumicino Airport, Turin Caselle Airport, Venice Marco Polo Airport and Verona Villafranca Airport) and six destinations in Europe including Bucharest Otopeni International Airport, Kiev Boryspil International Airport, Moscow Domodedovo Airport, Paris Charles De Gaulle Airport, Prague Ruzyne Airport and Saint Petersburg Pulkovo Airport. In the current week, the carrier deploys 77,880 weekly seats across its domestic network, of which 90.5% of system seats are deployed in the domestic market. Blue Panorama, founded in 1998, operates charter and scheduled services from its Rome Fiumicino and Milan Malpensa bases. It conducts international charter operations with Blue Panorama and short and medium operations with Blu-Express. In 2011, Blue Panorama carried approximately 2 million passengers in a fleet of 12 Boeing aircraft, of which six are widebody. 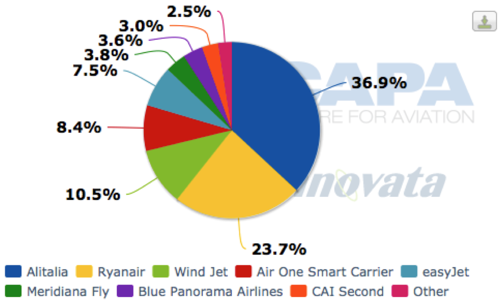 Wind Jet and Blue Panorama hold 10.5% and 3.0% of Italy’s domestic capacity, respectively, according to Innovata data. Also in the Italian market, Milan-based Cargoitalia ceased operations on 21-Dec-2011 due to mounting financial losses. The all-cargo carrier has since informed its Italian customers that the airline will be dissolved and liquidated. Ongoing market weakness and fierce competition led to the collapse, the carrier said, adding that the decision to establish a ‘Cargolux Italia’ subsidiary hurt Cargoitalia and hampered its business opportunities. Cargoitalia operated a fleet of three former Alitalia MD-11 freighters (with leases due to expire in 2013 and 2014) and had signed firm orders for five A330-200Fs. Prior to its collapse, the carrier had been restructuring its route network. The carrier, established in 2005 as the first Italian cargo airline, was also seeking to restructure itself as an ACMI and charter division. Cargoitalia has not been the only recent freight carrier casualty. Lufthansa Cargo spokesman Nils Haupt this month confirmed that Jade Cargo, its cargo JV with Shenzhen Airlines, will continue to ground services until an agreement on financial restructuring is reached. The carrier suspended all operations on 31-Dec-2011 due to "overall weak air cargo demand". “We hope that we will come to a solution soon because time is pressing,” Mr Haupt said. Local media reports in Germany indicate that Jade requires investment of EUR50 million, with speculation the cargo venture will end. Europe's economic woes can be attributed largely to these developments. Besides Spanair, none of them had obviously flawed business models and although several were relatively small, niche operators, it is highly unusual to see such a flurry of insolvency activity in an industry once noted for the difficulty of market exit – although private airlines have always been more prone to failure. But another repercussion, noted above, of the economic climate is the growing pressure on governments either to divest ownership or to cease subsidising national flag carriers. The likely upshot is for more failures and mergers or acquisitions over coming months, both for private and for government owned airlines. A substantial restructuring of the European industry is arguably long overdue and, although there have been some larger failures in recent years, the noose is now tightening around several older full service airlines in Eastern Europe. Merger or acquisition is a preferred alternative, but it is taking most governments a long time to accept that substantial compromises are part of making the candidate airline attractive to a prospective purchaser – especially as buyers are an increasingly rare breed.